Capital of the state of Bahia and the largest city in north-eastern Brazil, Salvador was the first town in the colony of Brazil. Founded in 1549, the early town sat on a crag accessed only on steep tracks climbing from the harbor almost directly below on the large bay called Baía de Todos os Santos. Today, this old town is still filled with 17th- and 18th-century colonial buildings that have earned it a UNESCO World Heritage designation. This is where you'll find Salvador's most beautiful churches and monasteries, which are among its major tourist attractions. 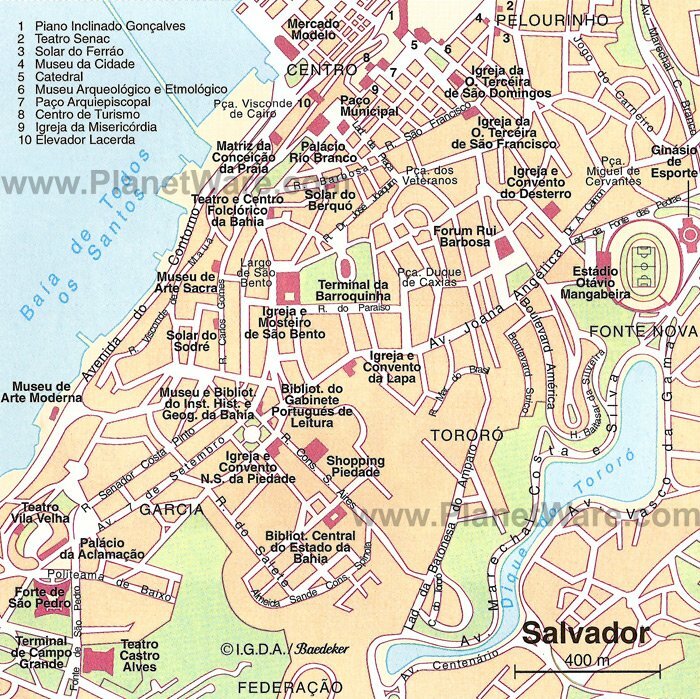 Salvador was Brazil's capital until 1763, when it was succeeded by Rio de Janeiro, and for three centuries, it was the principal port for slaves arriving from Africa. People of African descent still make up the majority of the population, and African influence is evident in Salvador's music, festivals, and cuisine, as well as in religious groups such as Candomblé and Umbanda. Salvador's Cidade Alta (Upper Town), which was the governmental and residential center when the city was the capital of the colony of Brazil, sits on an escarpment 85 meters above the shore. At its heart, in the district known as Pelourinho, is the finest ensemble of 17th- and 18th-century colonial buildings in Latin America, so outstanding that it was declared a UNESCO World Heritage site. In Rua Gregório de Matos are the Museu da Cidade (City Museum), with life-size Candomblé figures used in ceremonial dances, and the Abelardo Rodrigues Museum, containing sacred art and folk art, housed in a 1701 mansion. Prédio do Senac is a school of gastronomy where you can sample typical Bahian dishes; in the evenings you can often find dance performances and other folk events here. Also in the Pelourinho quarter is the Casa de Benin, devoted to the culture of the old kingdom of Benin (now southern Nigeria), from which most of the slaves were shipped to Bahia. In a city known for its strikingly ornate churches, São Francisco stands out as the most highly decorated, its interior awash in gold-covered wood carving. The gilding of the high altar is so ornate that it took two years to complete. The church mingles Mannerist and Baroque styles and was built between 1708 and 1750. The ceiling is painted in scenes and themes associated with the Virgin Mary, and the choir combines elaborate wood carving with azulejo (tiled) pictures. The walls of the adjoining square cloister are also faced with superb Portuguese azulejo pictures. Directly next to the friary church is the impressive carved facade of the Igreja da Terceira Ordem de Sao Francisco, church of the Franciscan Third Order. Statues of saints and angels and other sculptural decoration covering the face of the church, along with the sumptuous decoration of the interior, outdoes the Portuguese and Italian Baroque, resembling the Spanish Churrigueresque style so popular in colonial Mexico. The upper and lower towns are linked by steep streets and a number of lifts, including the Plano Inclinado de Gonçalves (a funicular) and the Elevador Lacerda, a dramatic free-standing elevator that has become a landmark of Salvador. Built in 1930, the Art Deco elevator links Praça Cairu in the harbor area with Praça Tomé de Souza in the historic old town. From the terrace formed by the upper plaza, Praça Tomé de Souza, there is a superb view of the lower town and the harbor. On Praça Tomé de Souza are a number of 17th-century buildings, including striking white Palácio Rio Branco, one of Brazil's most historic palaces and formerly the seat of the Bahian government. On the Terreiro de Jesus, adjoining Praça da Sé, is the cathedral, originally the church of the former Jesuit College, which was built between 1604 and 1656. The façade was faced with stone brought as ballast from Portugal, and the interior was decorated in Baroque style in the 18th century. The side chapels off the nave are especially interesting for the variety of art in the altarpieces, which date from the late 16th century through the mid-18th century. The sacristy is richly furnished and decorated in the Baroque style, with 17th-century azulejos (Portuguese pictorial tiles) and painted ceiling panels. At one time, the Jesuit seminary was the largest of its kind outside Rome, and it's interesting to tour for its cloisters and quarters. Also on the Terreiro de Jesus are the 1709 church of São Pedro dos Clérigos and São Domingos de Gusmão, a 1731 Dominican church with a Rococo façade. The original Carmelite church on this site was built from 1580 onward but burned in 1788 and was rebuilt forty years later. Its architecture is classic Baroque, with elegant lines and twin bell towers, but it is best known for its stunning sacristy, a room almost completely lined in gold. It now houses a museum of sacred art, the most outstanding of which is the cedarwood sculpture Christ in Chains by Francisco Manuel das Chagas, known as O Cabra, a slave who became a notable sculptor in the 18th century. The statue, carved in 1710, is set with more than 1,000 rubies, each representing a drop of Christ's blood. The architectural and decorative features of the large and beautiful convent next to the church have been carefully preserved as a luxury hotel. One of Bahia'a most popular churches is the Igreja do Senhor do Bonfim, built 1745-54. It's also the scene of a colorful festival. The church's ex-voto room contains thousands of votive offerings giving thanks to Senhor do Bonfim for miracles performed. In late January, an enormous procession of people make their way from Nossa Senhora da Conceição da Praia to the church of the Senhor do Bonfim, where they wash the steps leading up to the entrance. On the Monday following this washing, the Festa do Bonfim is celebrated with typical local food and drink, samba de roda dances, and performances of capoeira, a uniquely Brazilian martial art that combines acrobatics and dance. Salvador sits on a peninsula that separates the large natural harbor of Baía do Todos Santos (All Saints Bay) from the Atlantic Ocean. Both the bay and ocean coasts are lined by white sand beaches where locals go to hang out, picnic, surf, and swim. The beaches on the bay side are protected and good for swimming, while those on the open ocean provide plenty of waves for surfers. Closest to the city center is Porto da Barra, the site of Bahia's first European settlement and a popular hangout for locals, and Praia do Farol da Barra, which has rocky pools near the lighthouse and good surf conditions at the far end. In a lively neighborhood with lots of restaurants near the beach, Praia do Rio Vermelho is popular. South of the city are three coastal islands, of which Tinharé and Boipeba have long palm-lined beaches sheltered from the Atlantic surf. Praia do Farol de Itapoã, near the beautiful Abaté Lagoon, has huge dunes and wide protected beaches of white sand. As anywhere, it is advisable to leave nothing of value unattended on the beach. Construction of this beautiful Baroque church began in 1704, when the king of Portugal gave the land to the Irmandade dos Homens Pretos (Brotherhood of Black Men). As many of the workers were slaves and could only work at night after their regular labor was finished, the building progressed slowly for almost a century. It wasn't until 1870 that the façade (now painted sky blue) and towers were even begun. The church was for the black population, both slaves and freed slaves, who were not allowed to worship in the city's other churches. Inside, you'll find 18th-century statues of black saints, and behind the church is a slave cemetery. At the base of the Elevador Lacerda, Salvador's commercial and business center stretches along the harbor, from which you can take a boat to visit Forte São Marcelo, built in 1623. Near the elevator is the imposing Baroque church of Nossa Senhora da Conceição da Praia, built between 1739 and 1765 of pedra de lioz, a marble-like stone brought from Portugal as ballast in the sailing ships that transported Brazilian products back to Europe. The ceiling painting in the nave, done by José Joaquim da Rocha in 1773, is a masterpiece of trompe-l'oeil. In the church is a museum of sacred art. Browse in the Mercado Modelo for local crafts and in the labyrinth of stalls in Feira de São Joaquim to see the ingredients and flavorings for local dishes, or try some at the lunch counters. Several museums are in this neighborhood, including the Museu de Arte de Bahia; the Carlos Costa Pinto Museum displaying furnishings and jewelry of the 17th-19th centuries; and the Solar do Unhão, a colonial building housing the Museum of Modern Art. The Palácio da Aclamação, former residence of the Governor of Bahia, has beautiful gardens and a luxurious interior open to the public as a museum. The church of Santa Teresa was built from 1666 to 1697, modeled on the Gesó church in Rome. The adjoining former convent of Discalced Carmelites now holds the Museum of Sacred Art, with an important collection of 17th- to 19th-century portrait sculpture in clay, wood, ivory, soapstone, and lead. Particularly impressive are the sculptured figures and reliquaries by the Benedictine monk Agostinho da Piedade, notably the reliquary bust of St. Lucia from about 1630, one of the earliest examples of silver portrait sculpture in Brazil. The museum also contains works by the sculptor-monk Agostinho de Jesus and paintings of the Cuzco school and works of the great colonial painters José Joaquim da Rocha, José Teófilo de Jesus, and Ricardo do Pilar. Villa Bahia: luxury boutique hotel, excellent old town location, individually-decorated rooms, antique furniture, outdoor pool. Aram Yami Hotel: 4-star boutique hotel, eclectic decor, pillow menus, high-end toiletries, delicious complimentary breakfast, two pools. Sheraton da Bahia - Hotel Salvador: mid-range pricing, excellent customer service, two beautiful pools, 24-hour fitness center, full-service spa. Bahiacafe Hotel: budget-friendly hotel, historical center, colonial-style building, colorful decor.